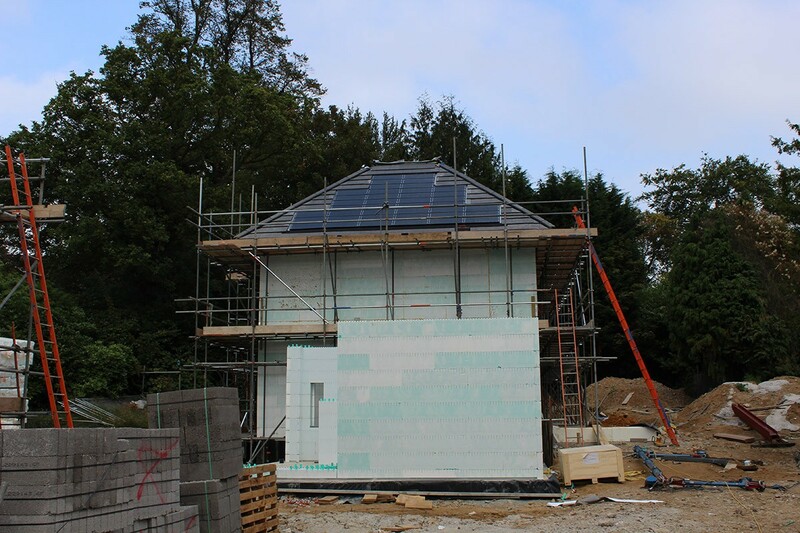 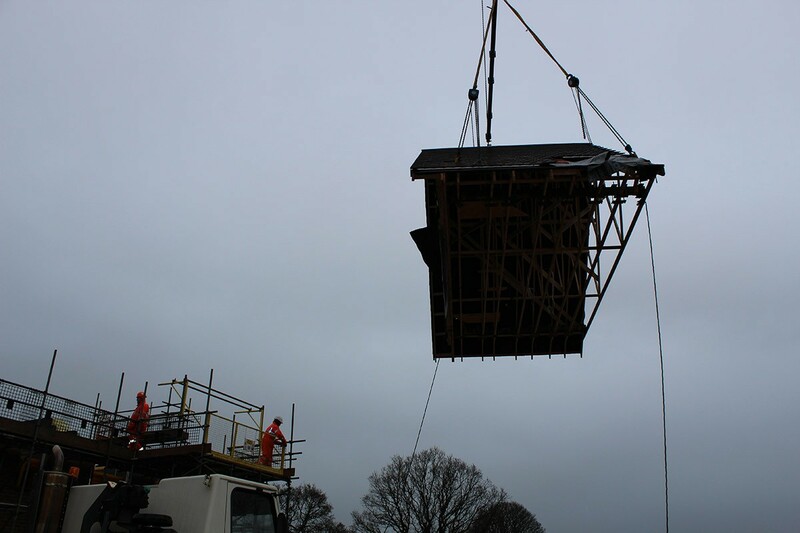 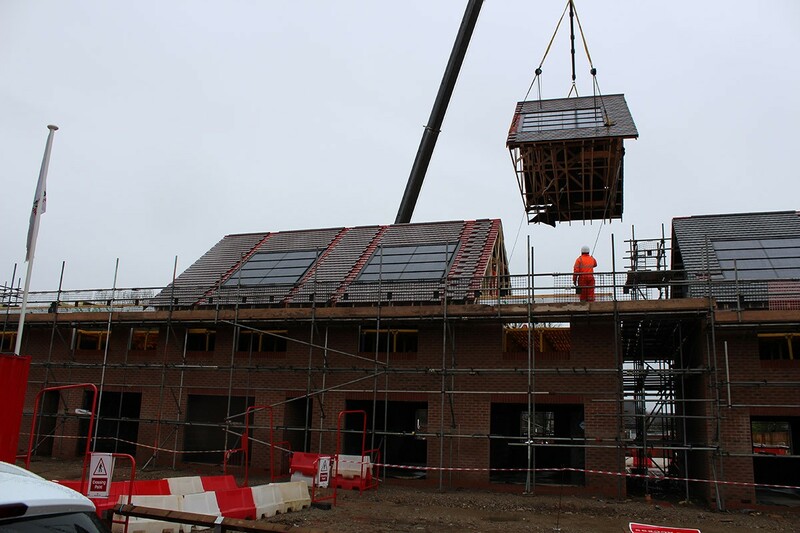 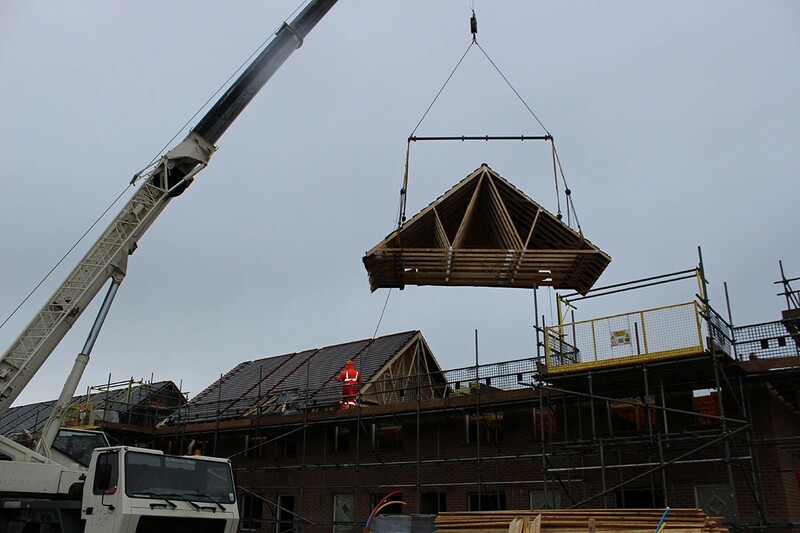 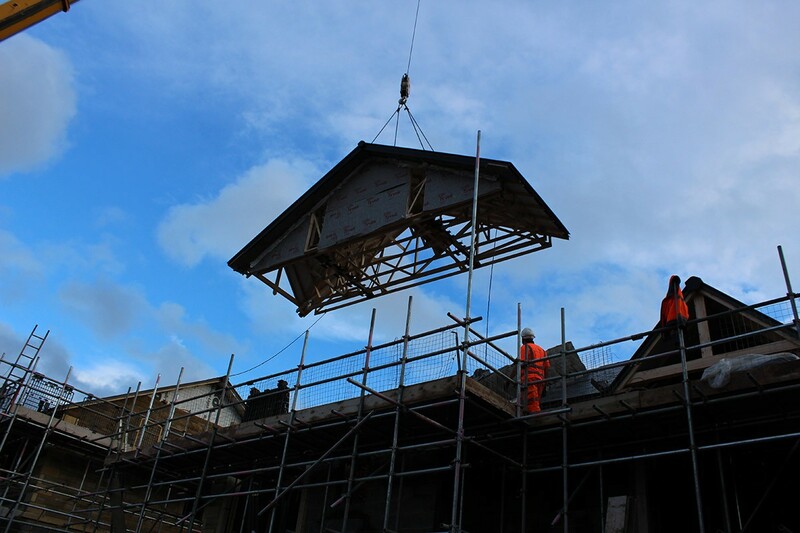 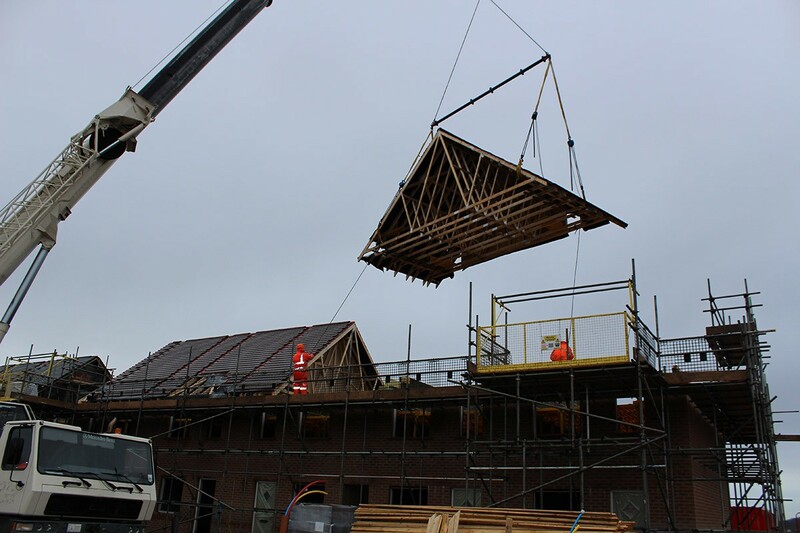 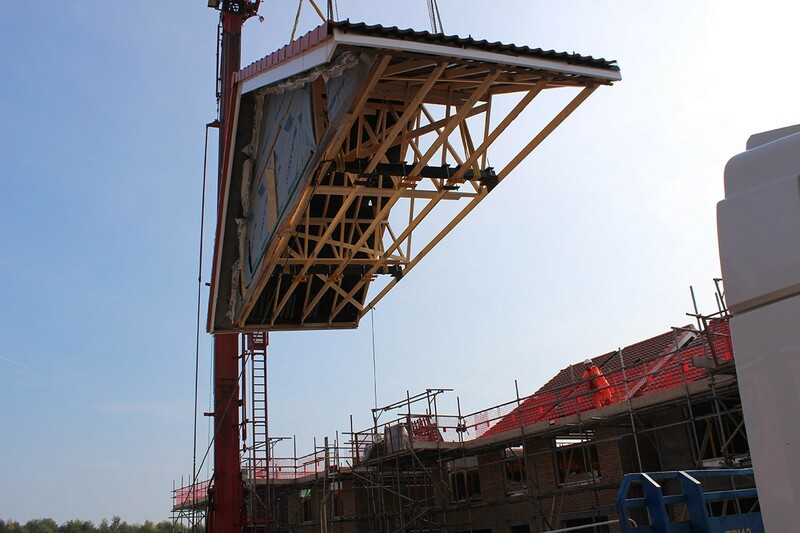 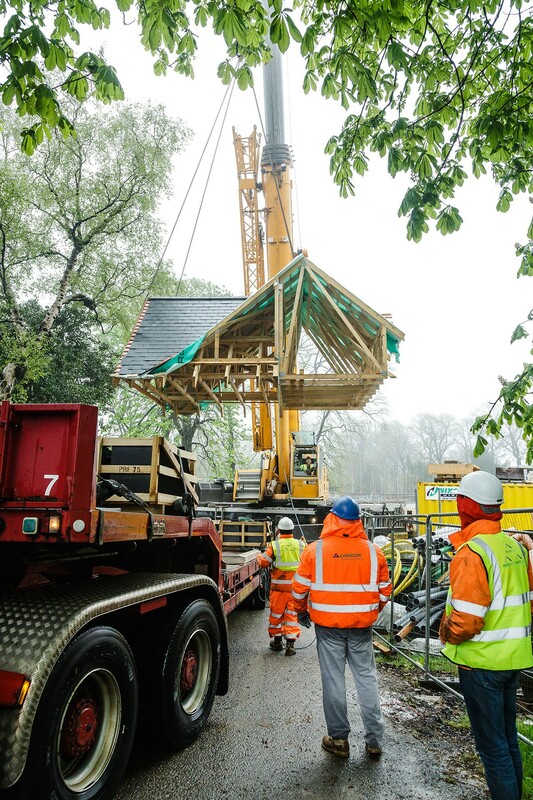 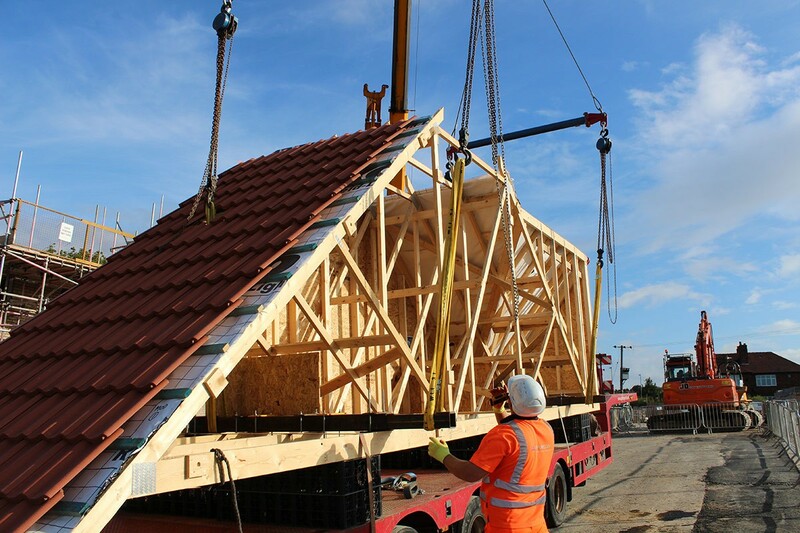 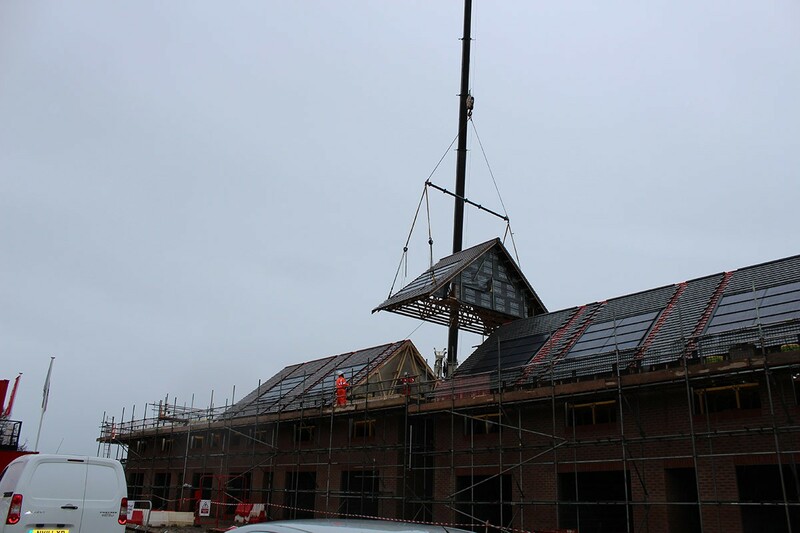 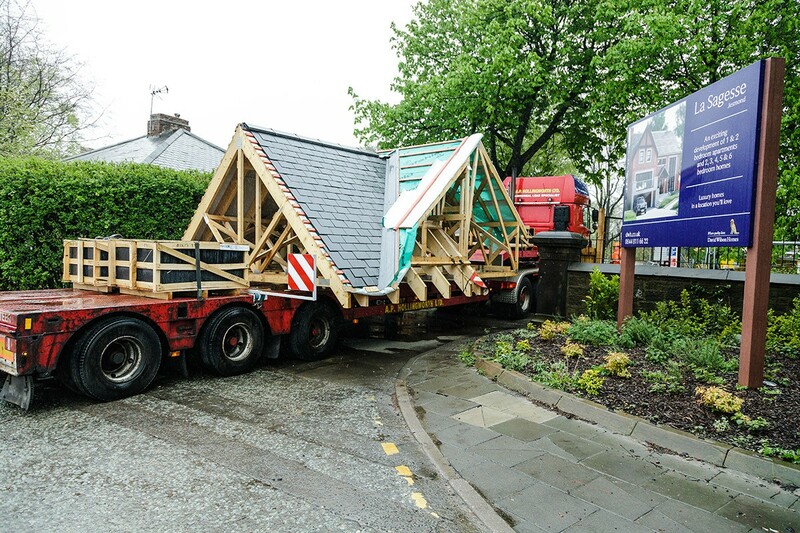 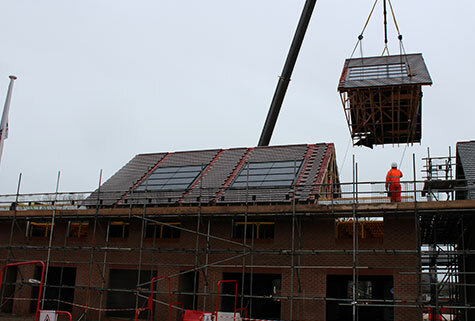 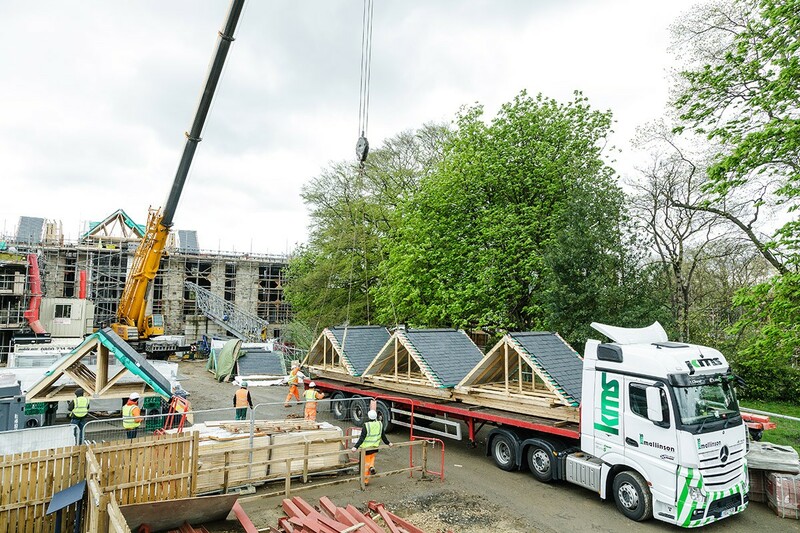 The innovative modular roof units are manufactured offsite in controlled factory conditions and rapidly assembled onsite – improving schedules for time sensitive projects such as building work during holiday periods, and minimising disruption to residents. 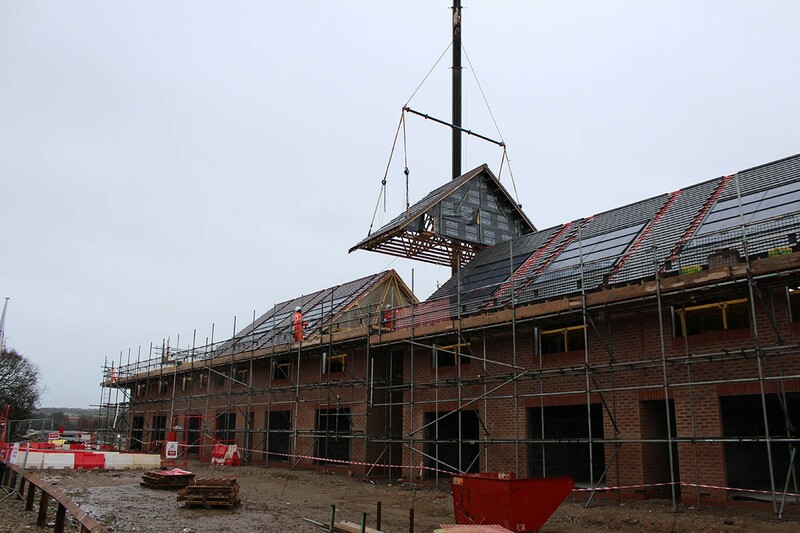 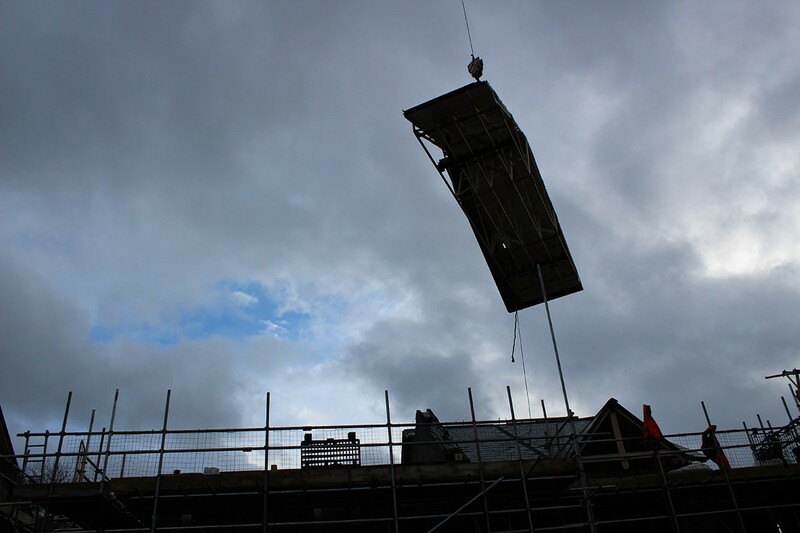 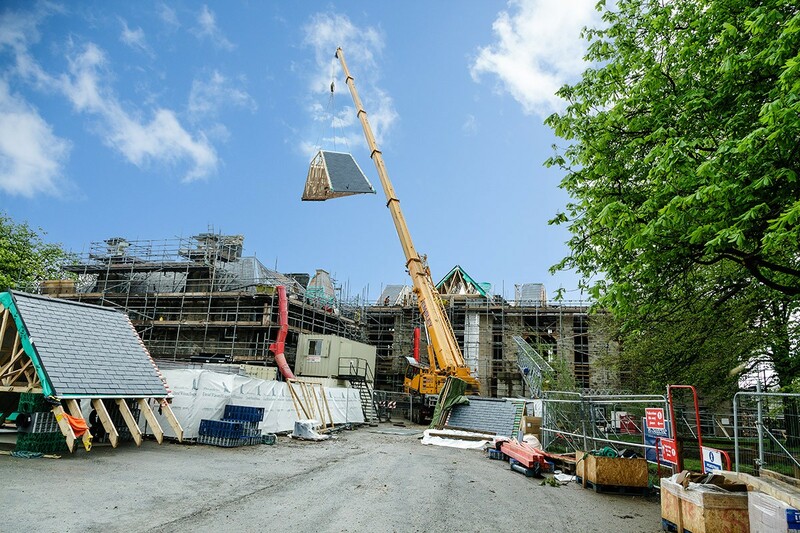 Our system helps improve Health & Safety concerns as it is built at ground level in a modern facility and craned into place, which reduces the need for trades at height. 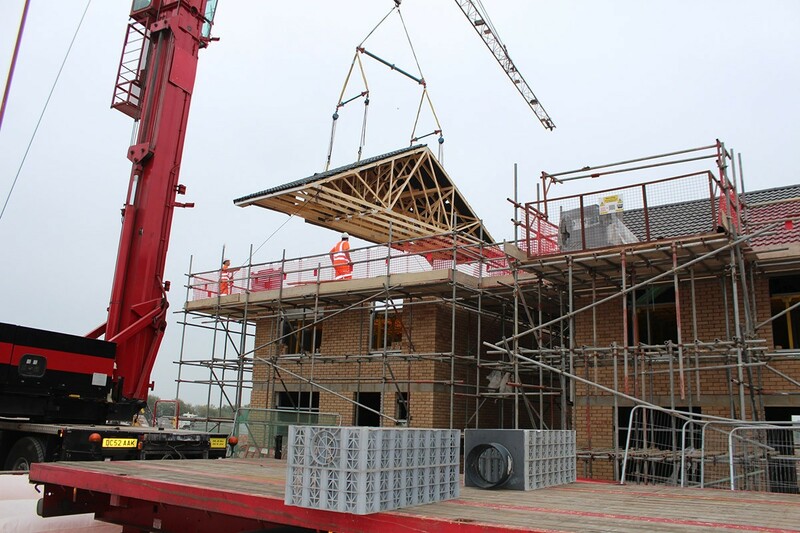 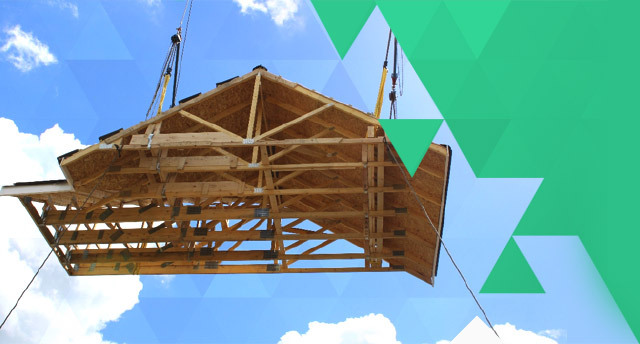 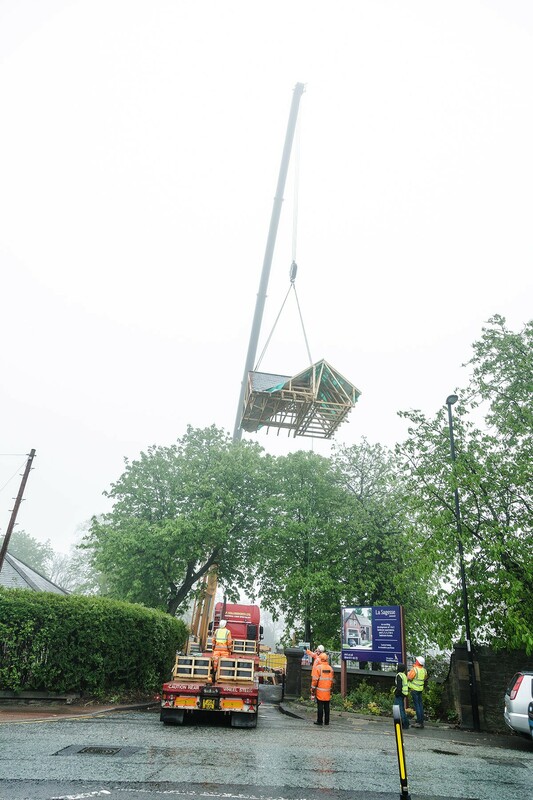 Offsite construction undoubtedly improve build speeds. 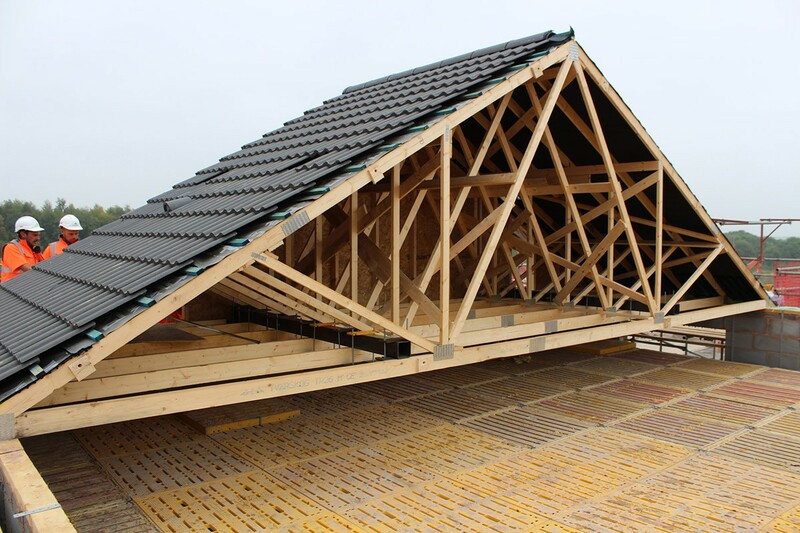 A complete roof of four modules in one day. 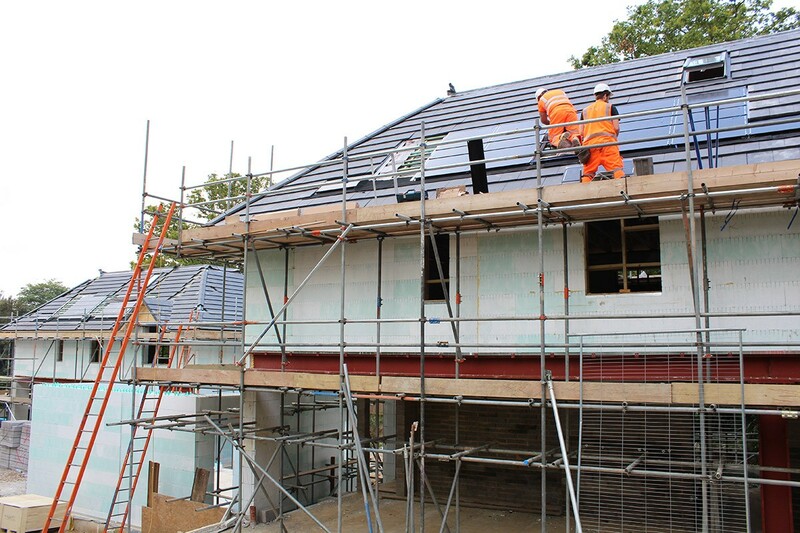 An additional day is required for join lines to be felted and tiled using the patented Zip Joint system, and interior edges sealed and skimmed. 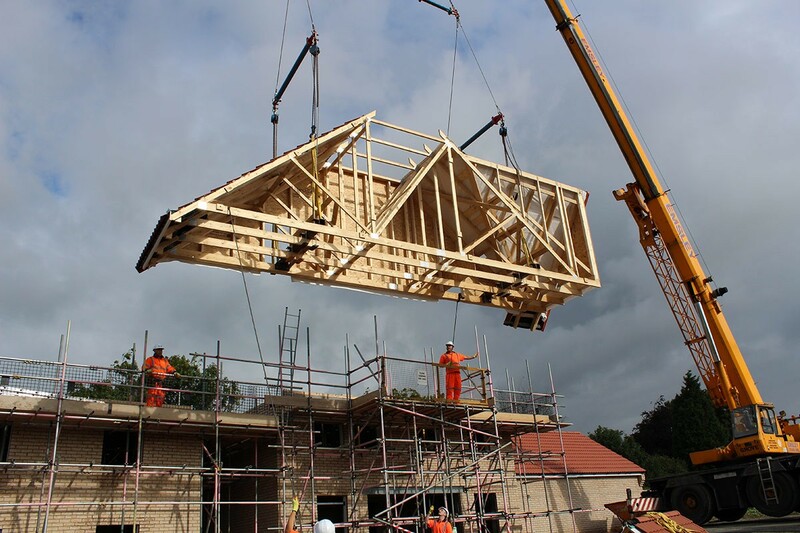 We understand that new housing projects are focused on time, design, structure and completion. 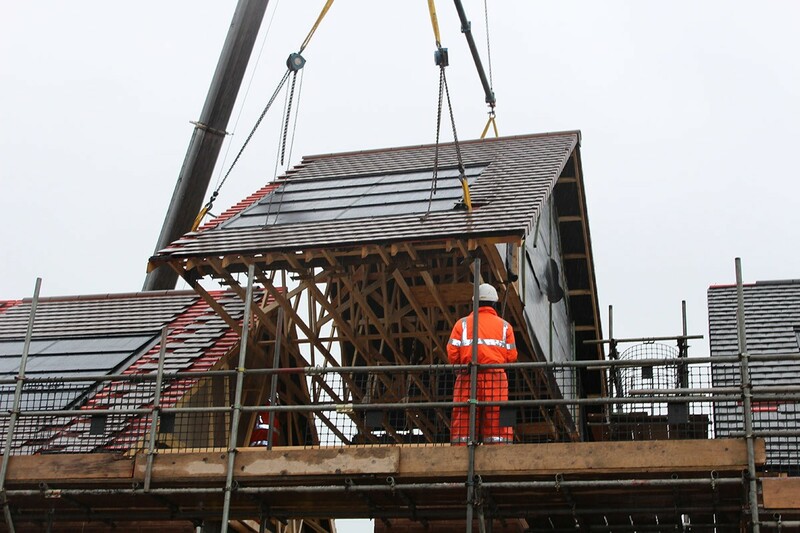 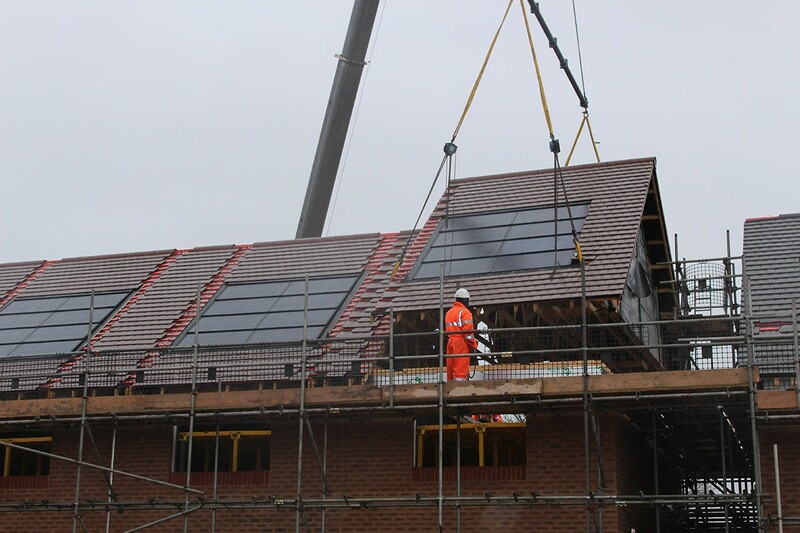 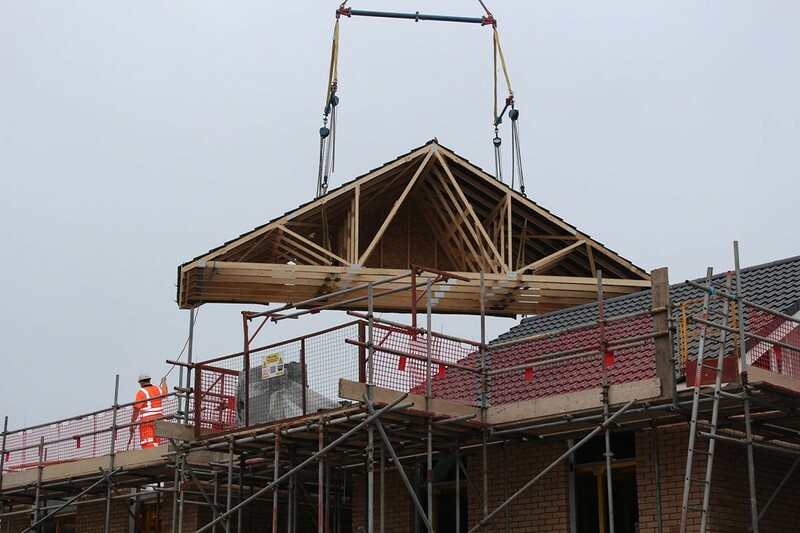 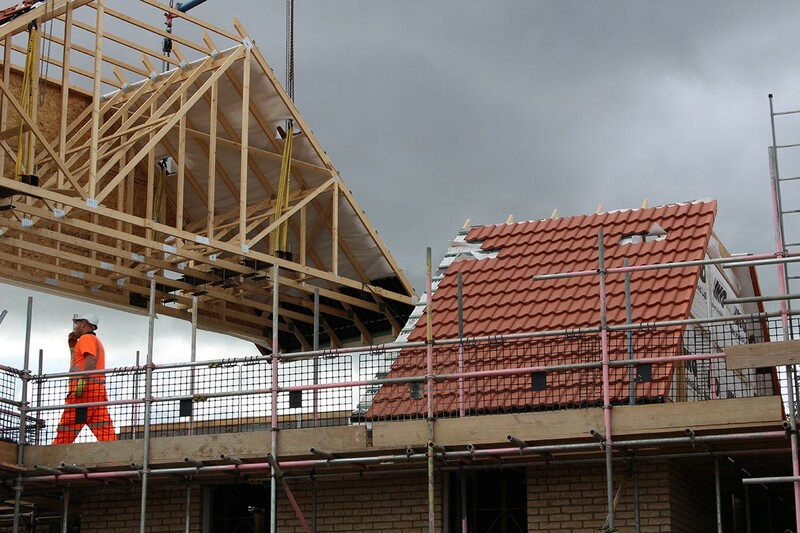 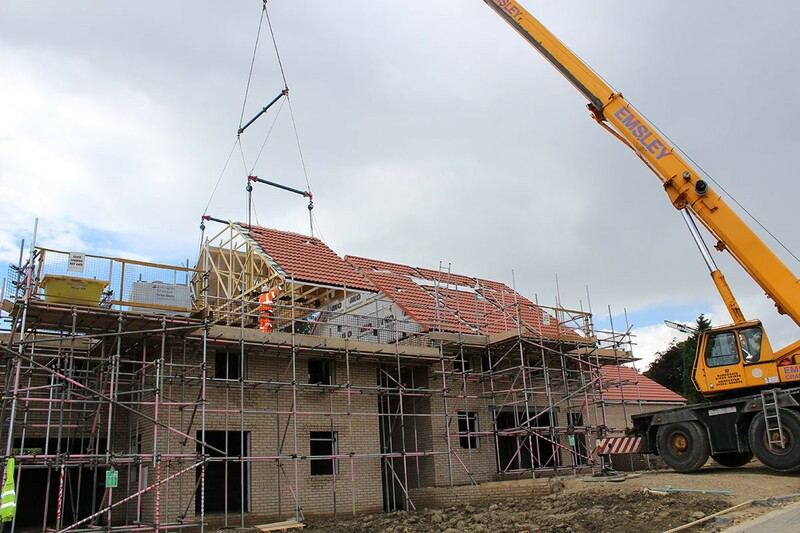 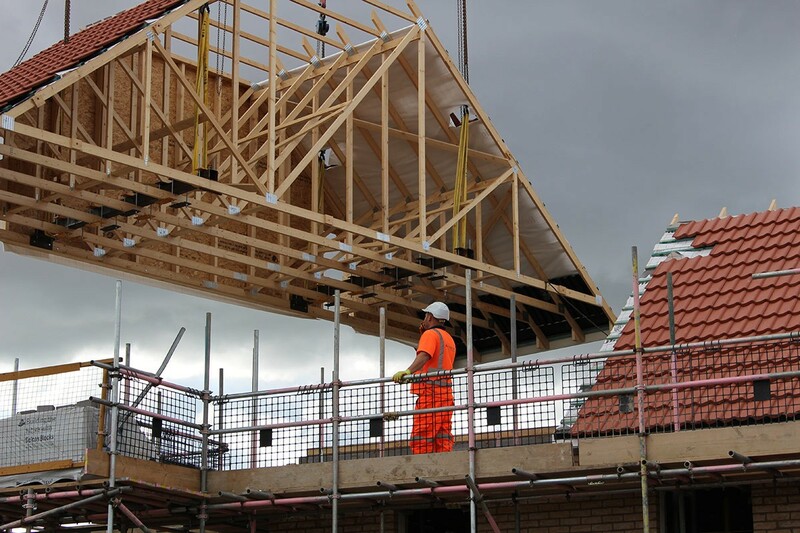 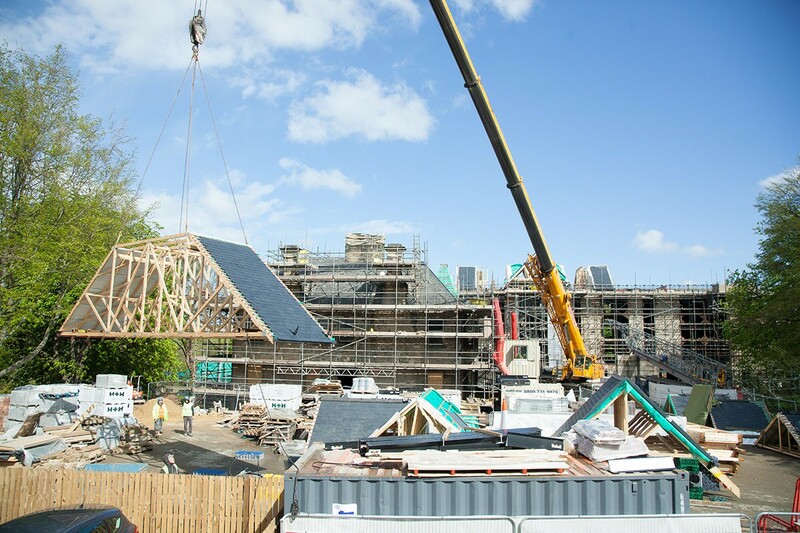 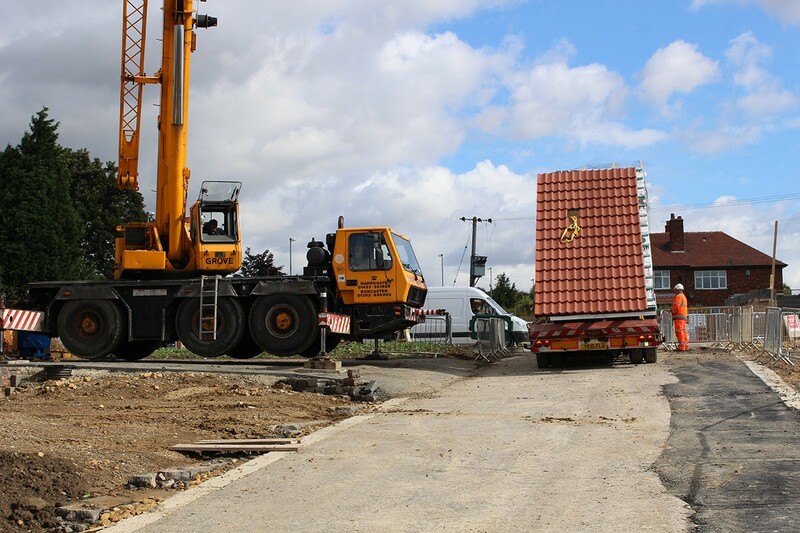 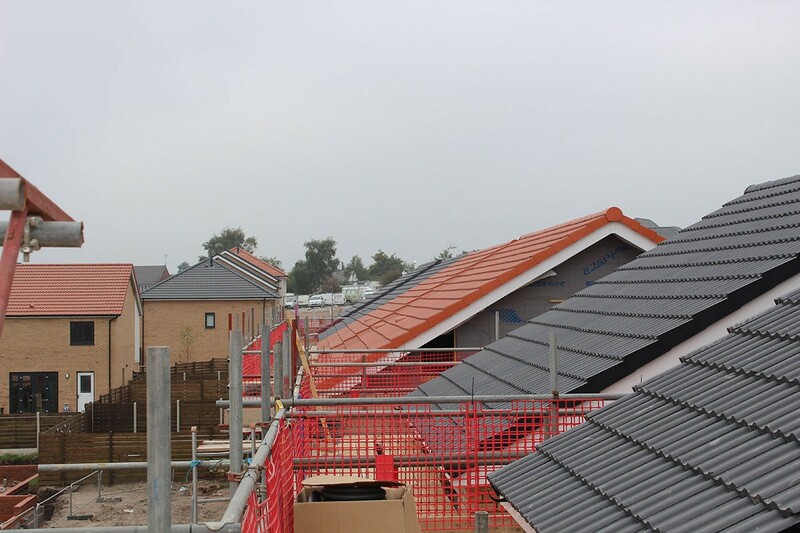 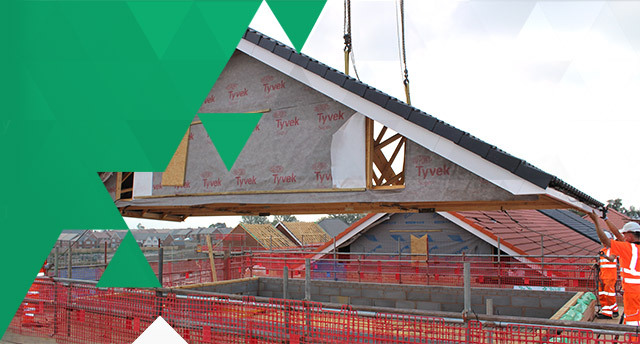 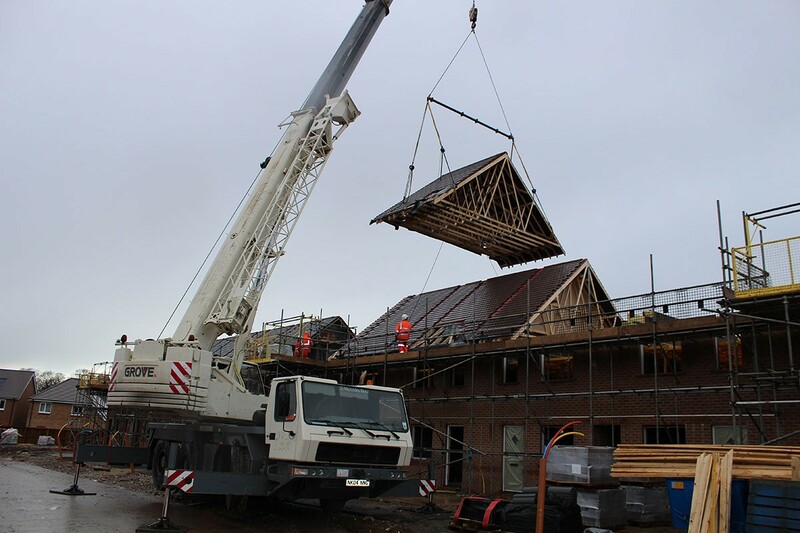 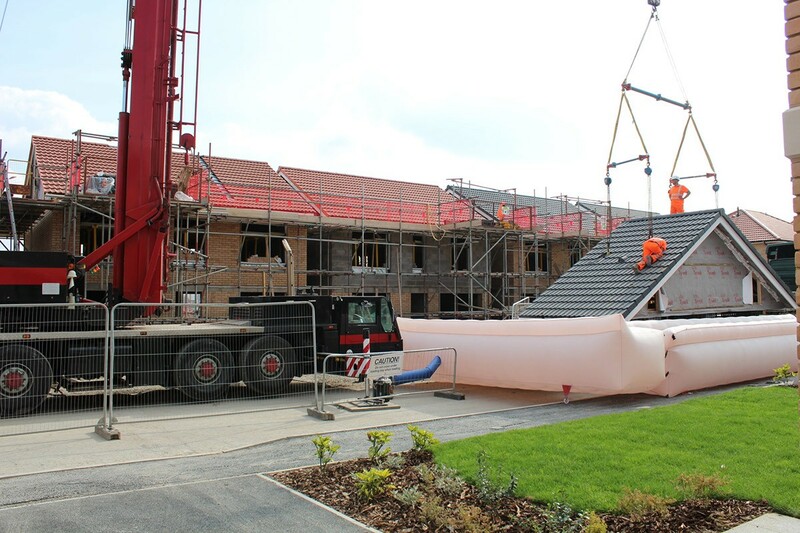 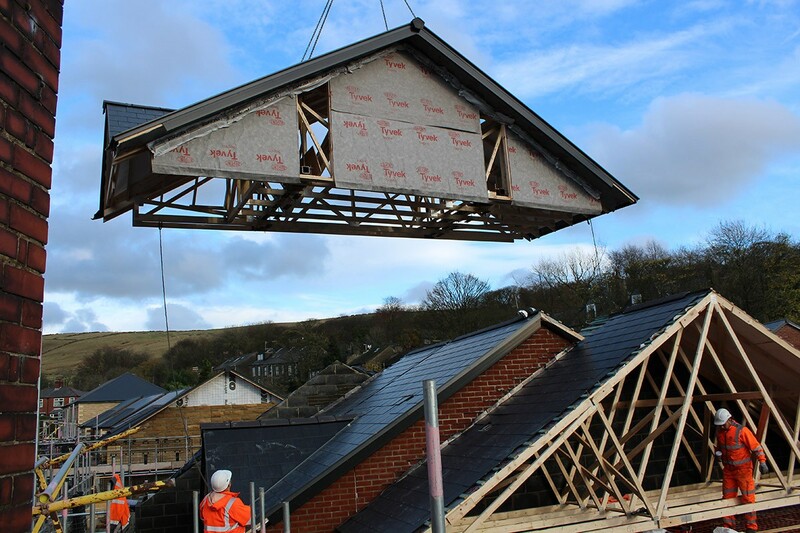 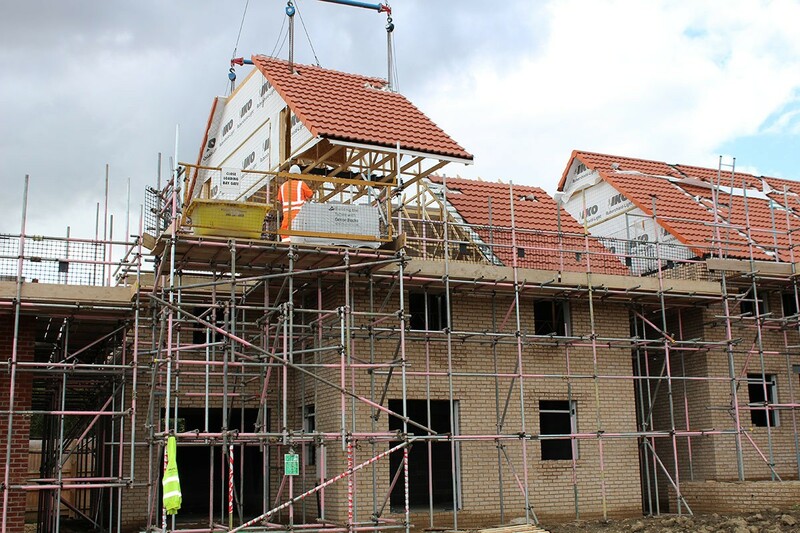 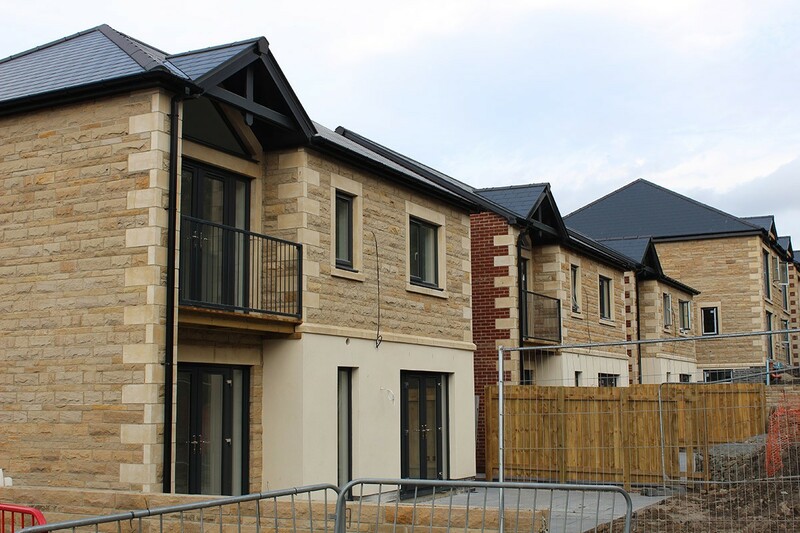 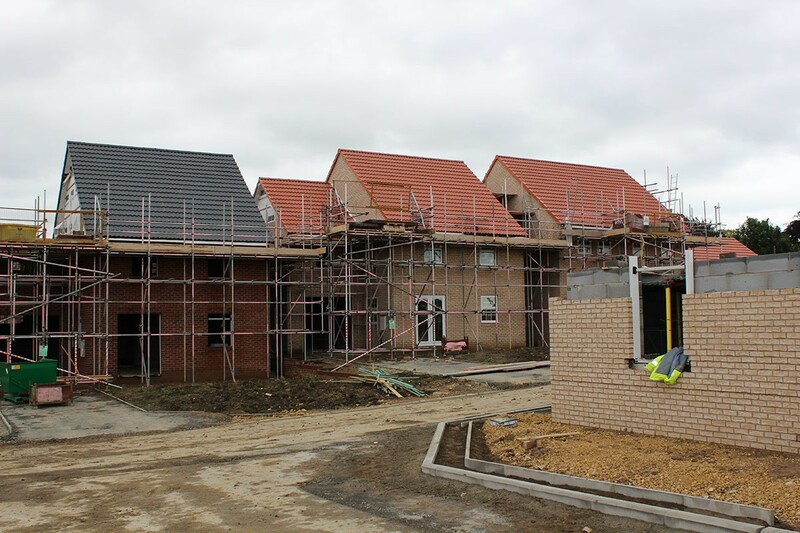 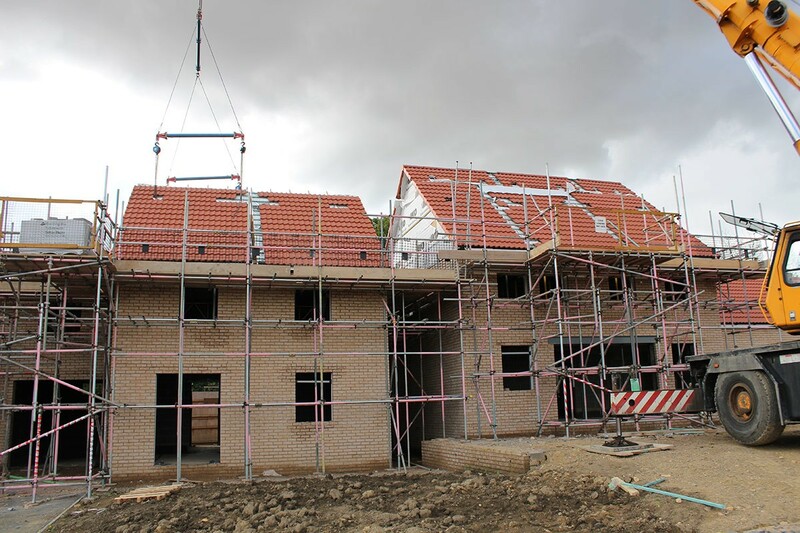 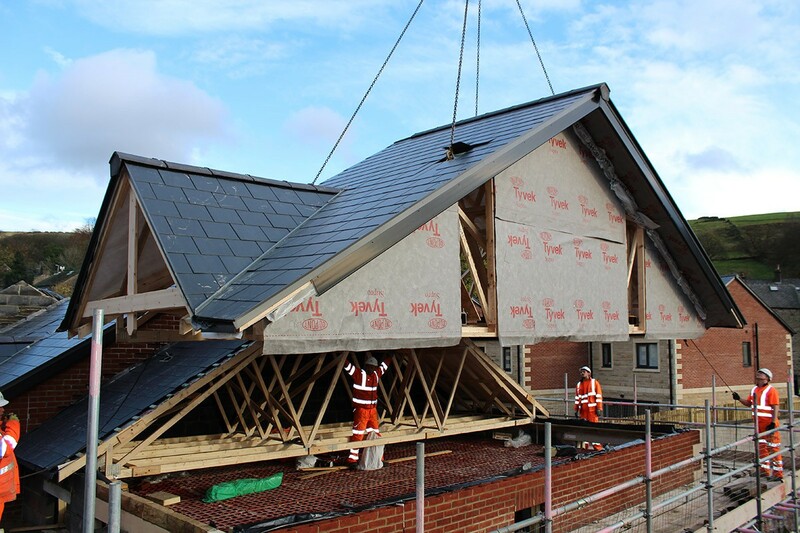 Moduroof can be a key solution for housing developments to help keep costs down on install and be flexible on install days to work around main build. 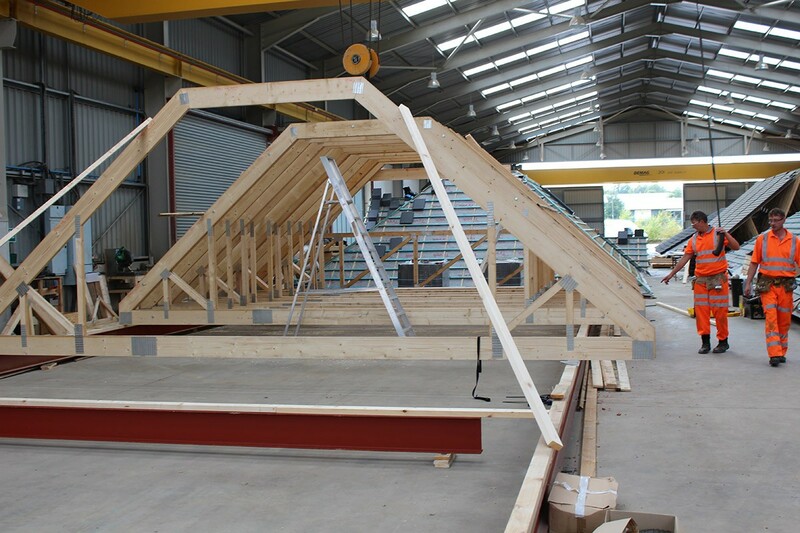 *Could vary based on scale of project. 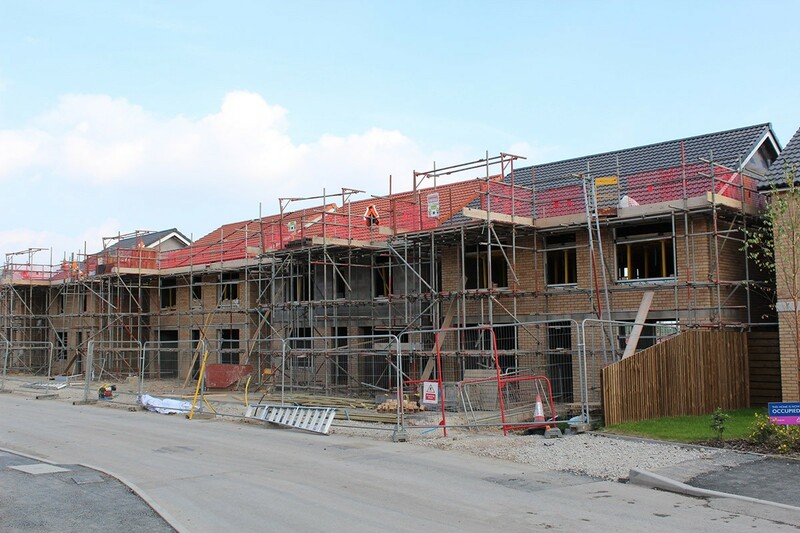 Two terrace rows of 6 plots to be installed in 4 days near Chorley. 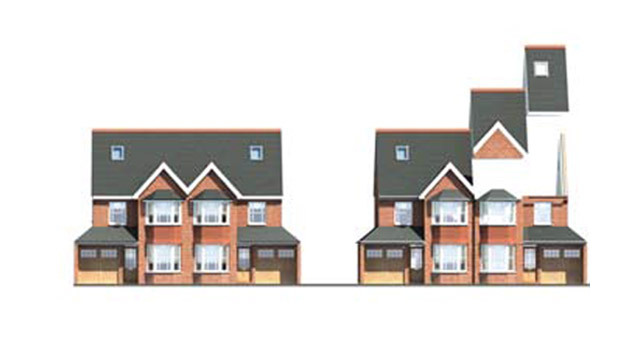 That’s 12 plots in 4 days. 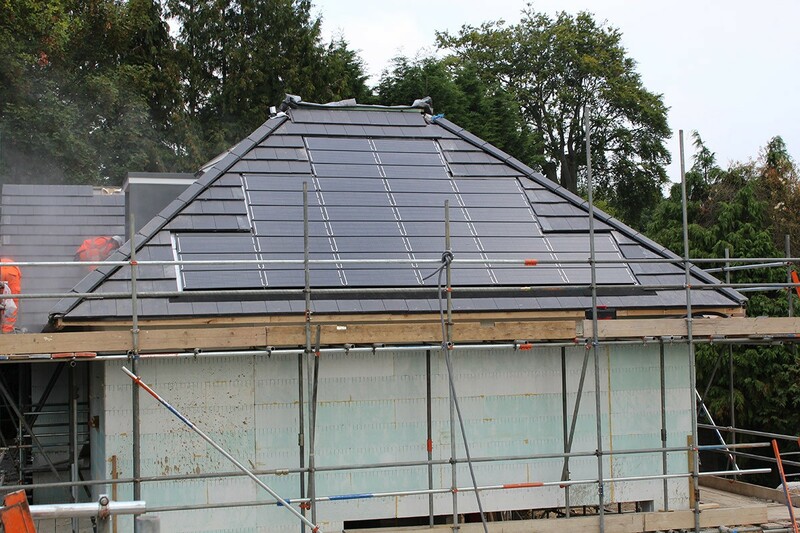 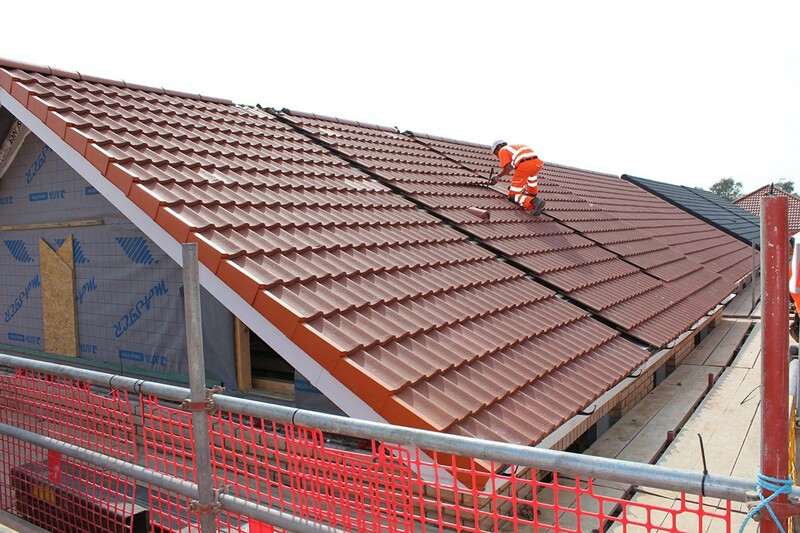 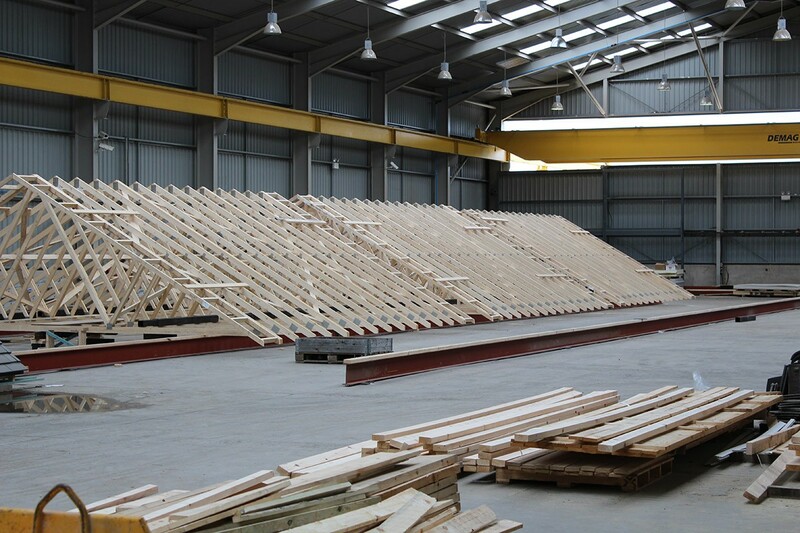 The roofs feature Forticrete Gemini Tiles with PV Panels installed by JJM in the factory prior to install. 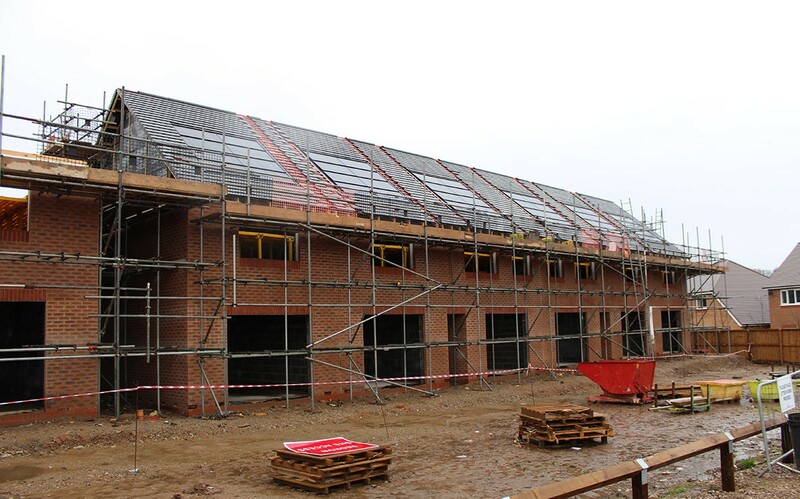 Installed in February 2015 this large apartment block nearly 50 metres long with a central raised section with projections front and rear. 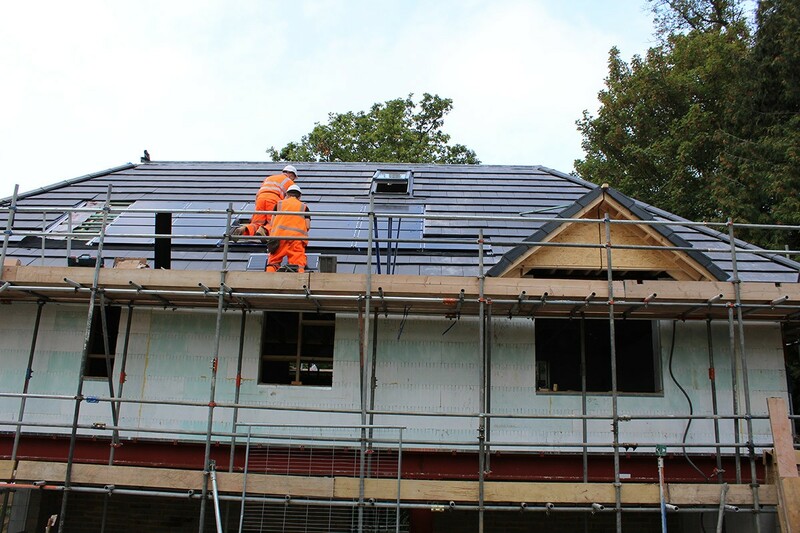 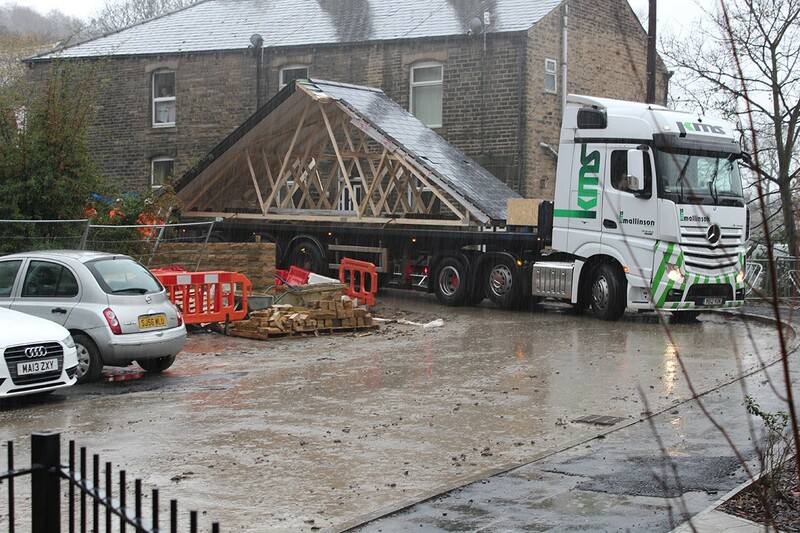 The roof covering is Spanish Slate with a number of factory fitted additions – snow guards and wind girders. 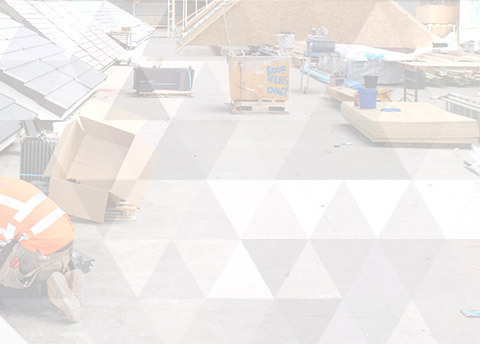 View the video of this installation here. 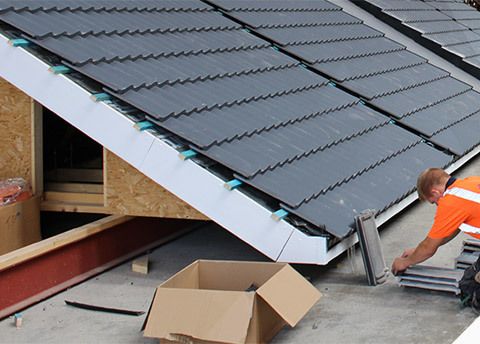 2 large warm roofs with detached garages featuring Forticrete Donard Tiles with Powercor PV Panels pre-installed in the factory together with Velux Roof Windows. 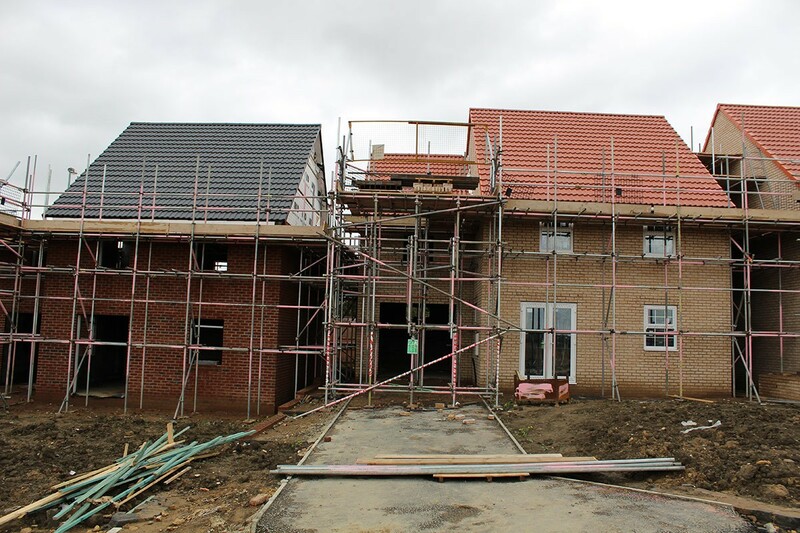 10 plots on a site challenged by very wet conditions throughout the year allowed the client to maintain their build programme. 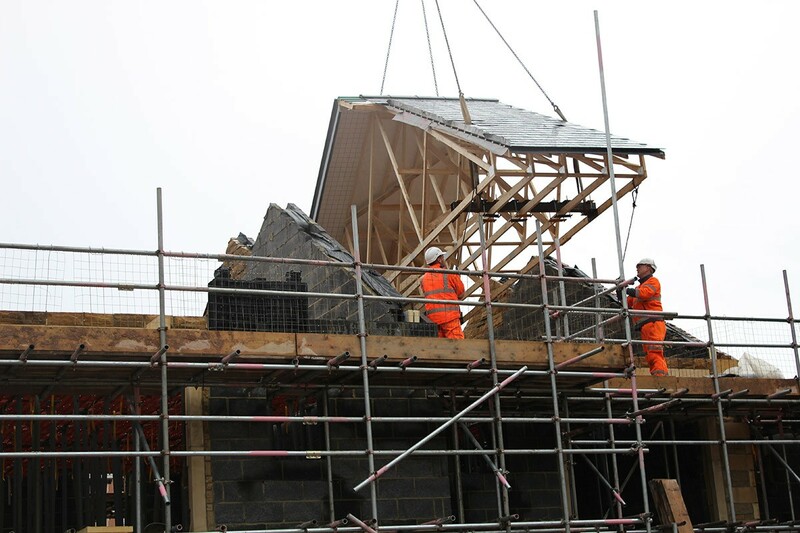 The roofs featured Marley Birkdale Slate and incorporated complex projections with feature trusses. 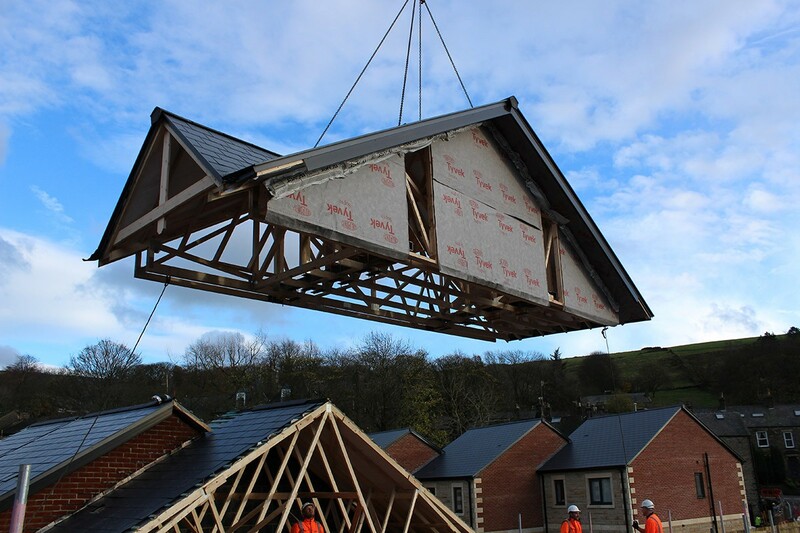 5 Abode Detached Homes installed in 3 days. 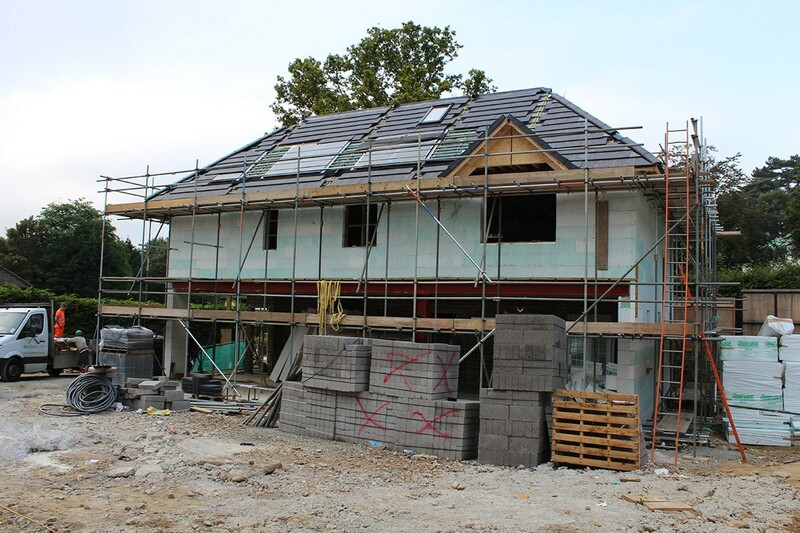 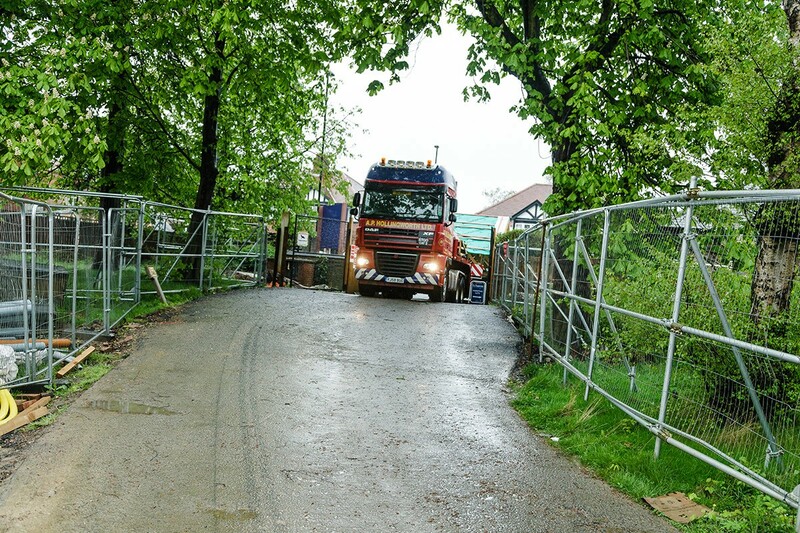 The client benefitted from a substantial reduction in build programme. 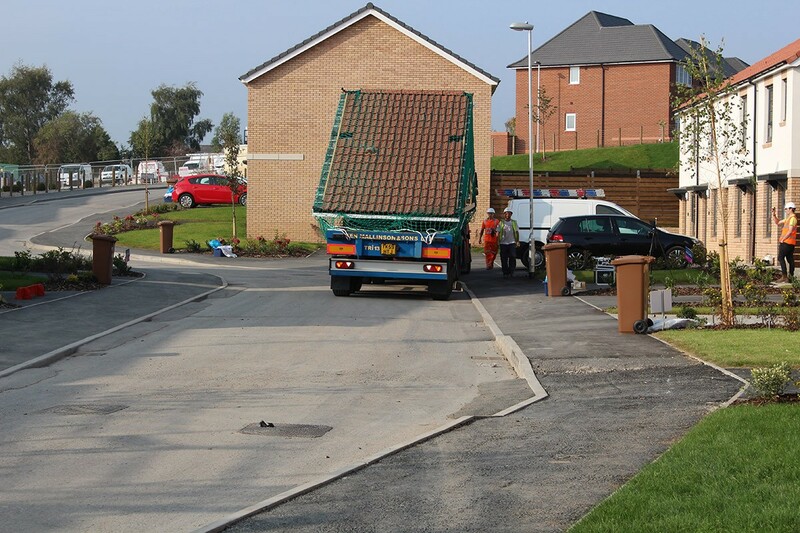 This was a test install for Redrow Homes and the install exceeded all expectations. 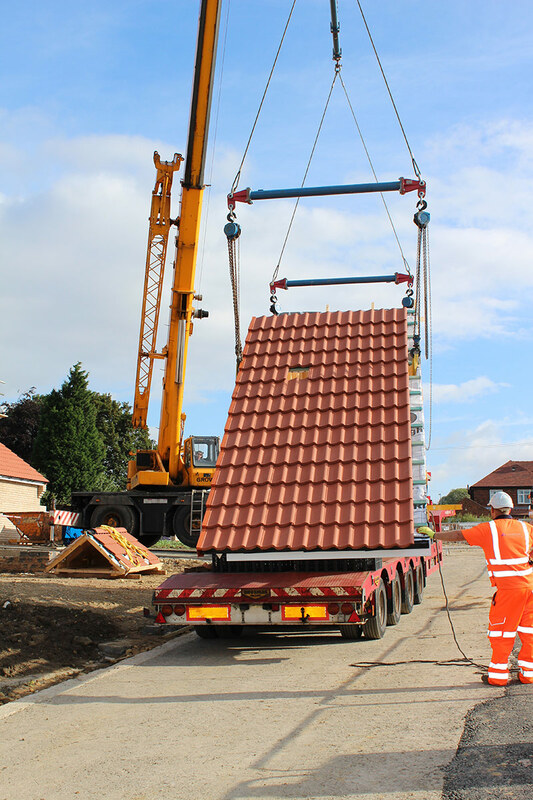 The roofs featured Russell Pennine tiles. 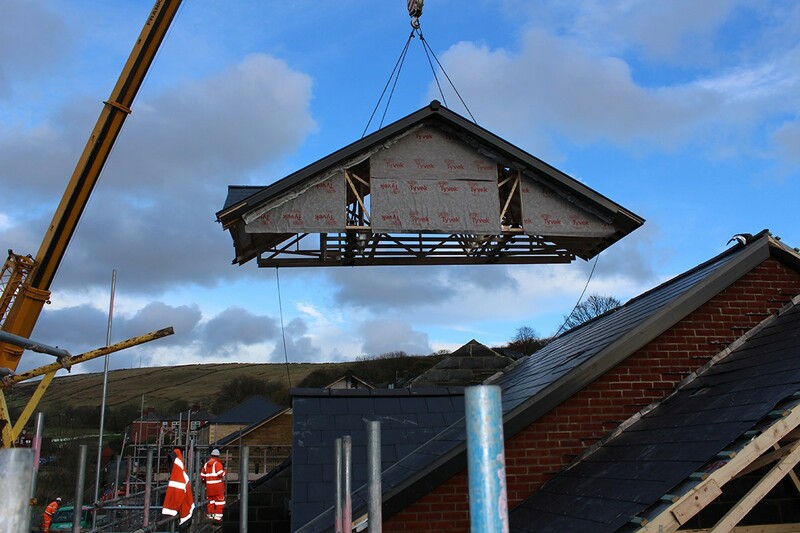 4 Detached Homes including two show houses installed in 3 days. 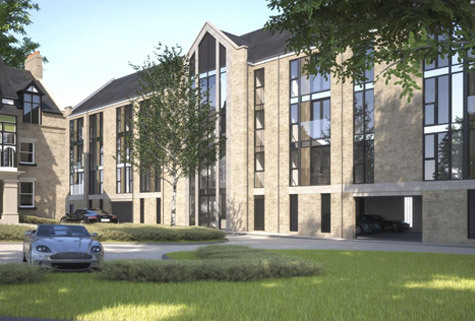 Two of the properties incorporated adjoining garages. 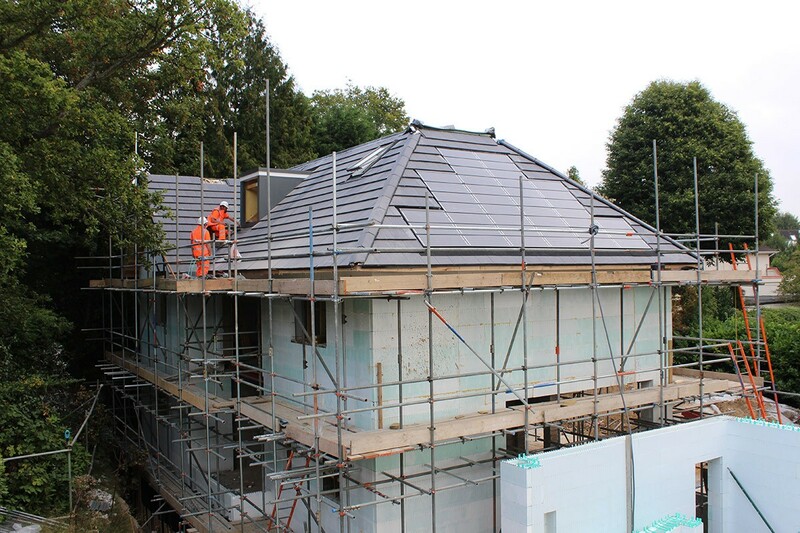 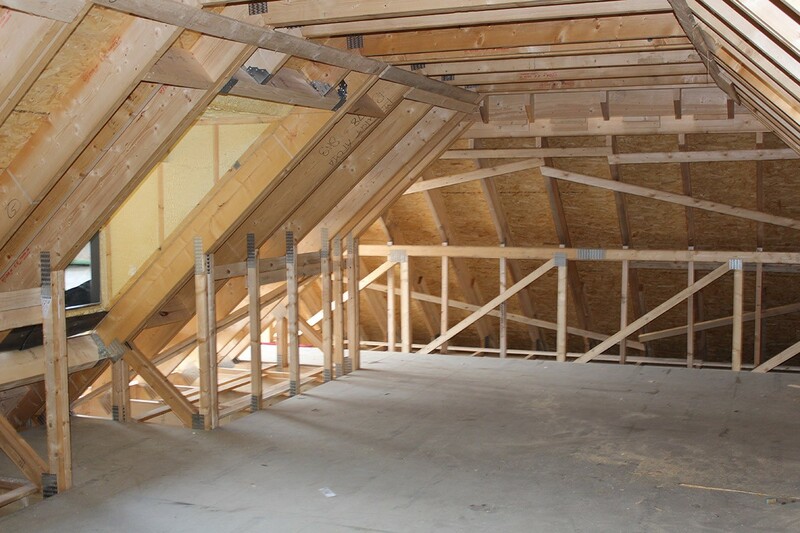 The completion of the roofs allowed the client to commence internal works immediately following the completion of the install. 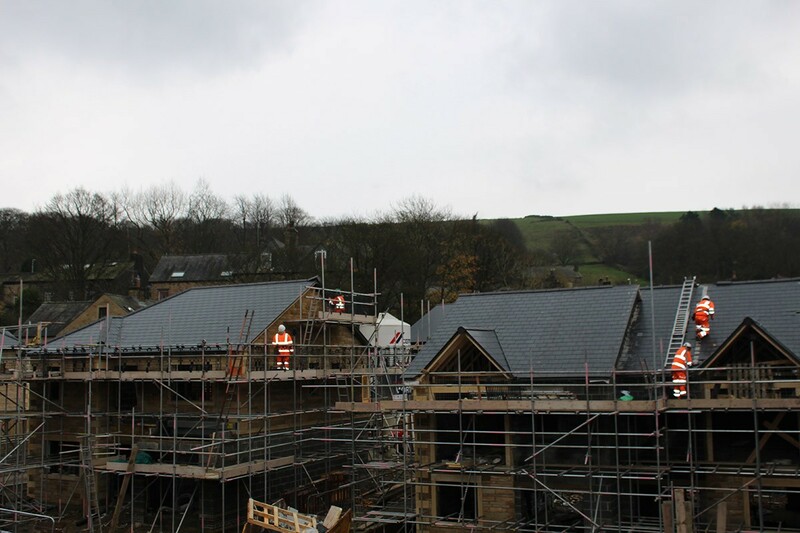 The roofs featured Russell Pennine Tiles.